This is all new to me so i'm not sure of what to do. I am 45 years young, married and have an 11 year old son called William. I also have a Staffie and his name is Jasper. My men folk say I think more of the dog and hogs than them, I think it's a bit obvious sometimes. Anyway I used to be with a local animal charity and was a trustee, last year I resigned due to various issues and decided to set up on my own as I've always loved hedgehogs and had them in the garden at home for many years. Last autumn I reared 3 small babies and hibernated them over the winter. In Sept last year we bought a new larger shed, isulated etc and thats where it all goes on. At present I have 6 hogs in from different areas locally and hoping to get them upto weight so again can hibernate and release next year. 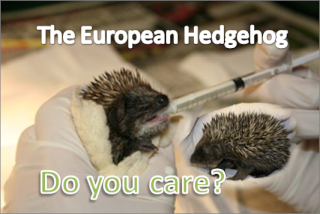 I'm no expert when it comes to caring for hedgehogs and sometimes need to phone either Derek at Epping Forest or Kay Bullen, they are both very helpful, for advise as you all know hogs are all different. This year has been hectic and a steep learning curve, very rewarding when we release and very emotional when we lose them. I have funded alot of things myself but now do car boot sales and tombolas to raise funds for vets bills, food etc. Our best fundraising item is the knitted hedgehogs that my mother-in-law makes for me, we charge a pound, and tell people that it pays for 2 tins of food, which it just about does, there is a picture of one of these on my website if anyone is interested please let me know and I will give you the pattern. As you can see I can drone on abit, so it's a pleasure to join this forum and hopefully we can keep more hedgehogs going with all our knowledge put together. Hi Helen! Bethany here. Thanks for joining the forum. Hope that everything is going well with your Hedgehogs! I have included some of your pictures on the forum, as you can see, they are fantastic. I think I have seen a picture of the knitted Hedgehogs on your website, will have a good look in a moment. It's brilliant to have you here, another hedgehog lover - and a dog lover too!! Have a look around, we have a general section and a joke section so plenty of opportunity fr chatting and laughing!! Hello and welcome to this Hedgehog forum. will have a look at your website in a moment. You don't drone on, was an enjoyable post to read. » Hi Guys this is Mel !!! » My garden has so many of these guys!! what is it? ?